Yesterday at The Magic Room, I attended a marvellous session organized by Expansions (curated by Sarayu Kamat). 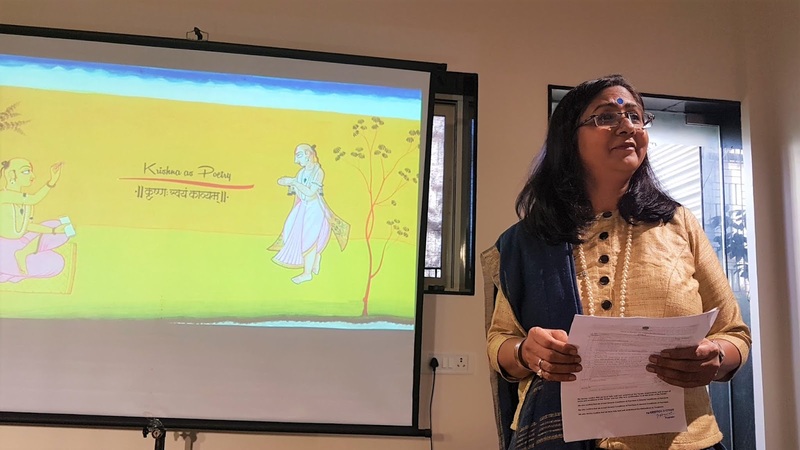 We listened to the very erudite scholar Dr. Harsha Dehejia speak on the many moods of Krishna Kavya. I do not reside in Vaikuntha, nor in the hearts of yogis. Where my Bhaktas sing my songs, there I reside, O Narada! 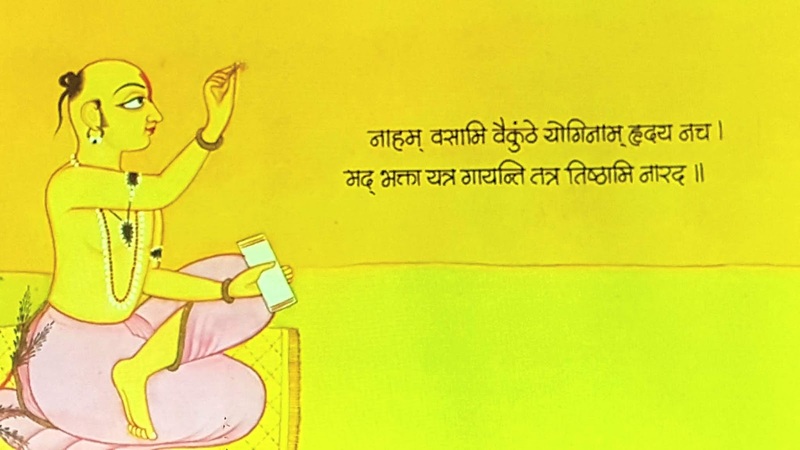 The invitation for the event said: "Krishna’s romantic presence is best understood as kavya and not as a katha, and that too as muktak, or fragmented moment of romantic pleasure. While enjoying the sensuality of Krishna’s shringara, a committed Rasika will endeavour to move it to shringar bhakti. 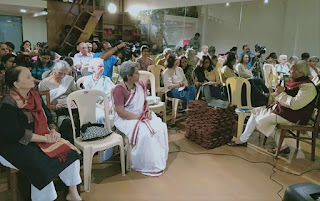 Krishna shringara ultimately should lead to brahma jnana and therefore ananda"
It was a pleasure listening to Dr. Dehejia, as he led us through the history of Indian Aesthetics, from the Vedas and the Upanishads, down to Brathrhari (Vakyapadiya, Sphota theory), Bharatamuni (Natyashastra, rasa theory), and Abhinavagupta (commentary on Natya Shastra). 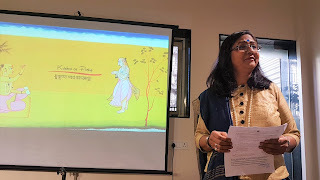 After giving us a better understanding of various expressions of aesthetics - shabda, shilpa, natya - he then took us into the world of kavya (art, music, poetry). Specifically, he took us for an exploration of Krishna Kavya, tracing the major art and poetry movements of northern and eastern India. I learnt a lot, particularly about saakar and niraakar concepts of brahman, about bhakti poetry, about the advaita and dvaita concepts that found expression in the literature. I also learnt the answer to a question that had been puzzling me, the question of Radha. I had never understood how suddenly Radha became a major goddess when she is nowhere in the Puranas. I learnt that Radha is a later construct by poets, particularly Jayadeva and Chaitanya Mahaprabhu. It is a great example of how poetry/music seeps into the Indian heart and fills it with emotion, even leading to mass acceptance of new gods and goddesses. I also learnt a lot about the major poets of the Krishna tradition, and developed an appreciation for Pahari and Rajasthani miniature art. 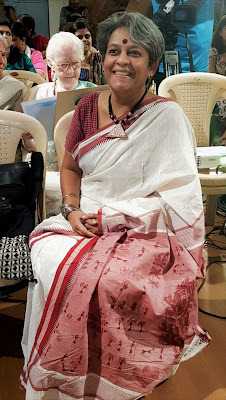 I wore a slice of tribal village life yesterday to the event - a handpainted Warli Art necklace and saree. Indu has done such a lovely project with this. The saree has a base cotton weave from Madanapeta in Telengana, and it was the perfect brown to set off the beauty of the Warli pallu. The artist who painted the necklace and the saree is from the Warli people, living in a village about 4hrs from Mumbai. She went to the village and got the jewellery and saree project kicked off. I felt very good to have supported this work, and it is a joy to wear something that has personal meaning. The Kotpad blouse from Odisha was really perfect! I have increasingly begun to make conscious choices about what I buy and wear. In May 2015, I went to a tribal area, about 4hrs drive from Mumbai. Since then, I have been working on a series of water projects there. Along with my friend Malathi, we have been building checkdams, ponds, wells, and rainwater harvesting structures. This is our latest project in the village of Aptale. It is a Thakar village. 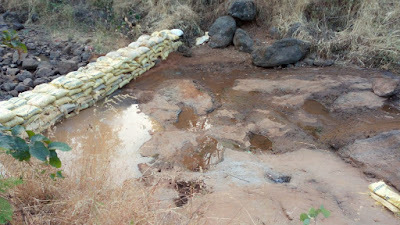 This area gets a lot of rainfall in the monsoons, but goes dry after the rains. Already you can see how the countryside has turned brown. The water is from a perennial source which is a small trickle that gets lost in a muddy slush. 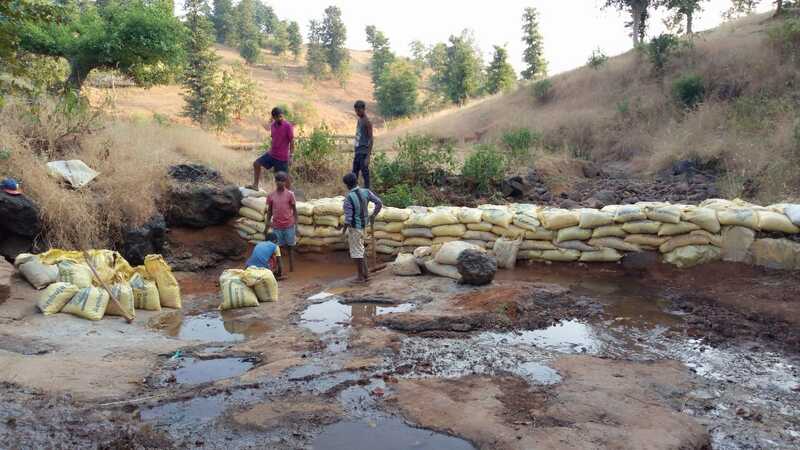 In fact, the mud blocks the trickle and it stops flowing after a while. So now the mud has been removed and put in recycled gunny bags. It forms an impenetrable layer and the water will fill up the available stony basin in the coming months. We normally use boulders with a plastic lining but this is faster and less expensive. And it uses second-hand bags which are easily available in the local market in Jawhar. This time we have experimented with a "fixed cost model". Instead of paying daily wages, we have given a fixed amount, after supplying the gunny bags. We told the village that it's now upto them to do it as efficiently and quickly as they can. 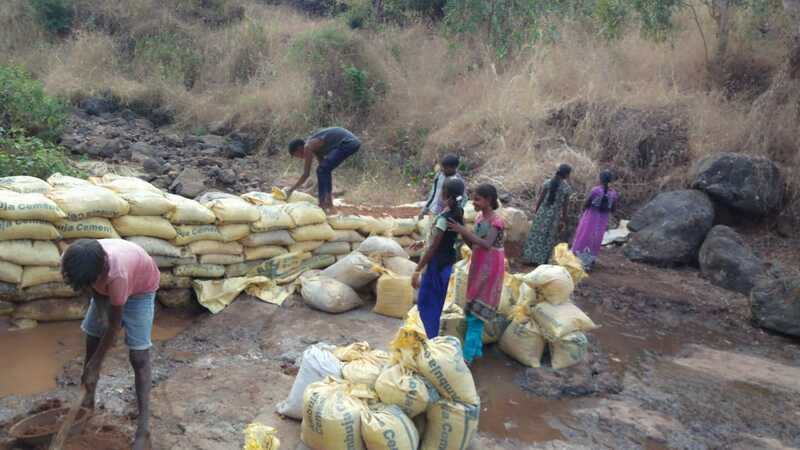 The daily wage model doesn't work in Aptale, since we cannot monitor the project all day long. A team of 20 people did this project. 10 people worked for 2 days, and another team of 10 people for the next 2 days. That way the earnings were spread over multiple families. We did not decide who would work. The village has come up with this system. I think that's a very good thing. The project is now finished. Waiting now to see results in the dry months ahead. As usual, I am taken aback to see how much can be achieved in rural India with very little money actually being spent. So I turned 50 yesterday. I thought about what I want to do with the next 10 years of my life. I want to work further on rural water management and livelihood projects. I have set a target for myself of 1000 projects; big and small. Have done maybe 50 so far. Have a long way to go and much to learn. Seeking blessings from all elders here and strength from friends. Inspired by many women who are decades my senior and continue to do good work. Horace van Ruith, a painter of German origin, arrived in Bombay in the late 1800's. He stayed in Cumballa Hill and established a studio there, at what was called the Cumballa Hill Family Hotel (which is now the Parsee General Hospital). Van Ruith painted landscapes, as well as portraits. But his career really took off when he started to do these Oriental scenes, and found patronage from Indian royalty as well as Prince Arthur, Duke of Connaught. The painting above is of a Brahmin household, says Sotheby's. To me it looks more like a small local temple courtyard, given the sadhu sitting in the corner, the tiling on the wall, the temple bells and the woman returning after offering prayer. Perhaps it is a small shrine, part of a nobleman's large private wada. I liked all the little details in the picture; they are so very real and authentic. No foreigner could paint these from memory, so I am sure there was a photo or a series of photos for reference. 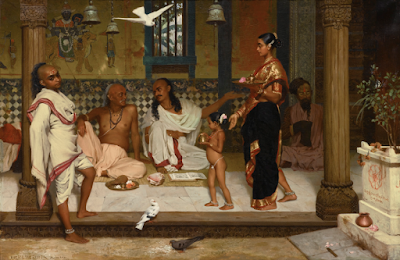 Photography had come to India by the 1840's, and since no such family scene could have possibly been caught on camera, it is likely that this picture was 'made up' from some photographs of a more public location, combined with the painter's imagination. It is still a commendable piece that portrays small details perfectly. Of course, like all paintings of the "exotic Orient", this one too leaves me somewhat troubled. When I see my culture represented via a Western Gaze, it's as if someone else has taken over the narrative, and I am seeing myself through their eyes, in a way that I may not particularly agree with. What is this Gaze thing, and why does it matter? My cousin Lavanya recently said something about "The Gaze", which I found interesting. Gaze: to look fixedly, intently, or deliberately at something. This painting to me represents a Western gaze, the gaze of an outsider who sees something strange and mysterious and seeks to portray it that way. The problem with this is that when framed through the eyes of colonizers, complex cultures are often reduced to exotic stereotypes ... for example, if I were to ask you to describe Brahmin society on the basis of this particular painting, what words would you use? To me it seems to show a very idle community (see the sprawled, relaxed posture of the two men). Yet it seems to be a prosperous community (note the prosperous, healthy boy and his jewellery), using strange books and ritualistic paraphernalia to make their living in the world. It is a patriarchal community as well, with a little girl being trained in the ways of her dutiful mother (she with the downcast eyes). It's easy to see how such a portrayal may help build an image of a slothful and backward society that needs to be saved by Jesus, or reformed through colonialism. Whether you agree with van Ruith's portrayal of Brahmin society or not, in the end, such exotic stereotypes end up creating "others" versus "us". 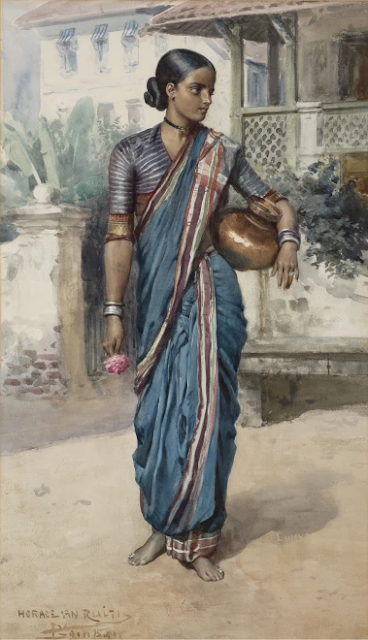 In this painting, a Maharashtrian woman is portrayed somewhat pensively, delicately, suggesting that she is as soft as the flower she is carrying. This then, is the Male gaze, depicting women and the world, from a masculine, heterosexual perspective. From the khuna blouse to the Narayanpet saree, to the hair tightly done in an amboda, this one is so real. But if you have ever carried a pot of water in a heavy copper pot, then you'll know that it takes strength. However, male representations do not usually reflect the strength of the woman. And we, the viewers, both male and female, internalize this male gaze, and begin seeing ourselves thus. 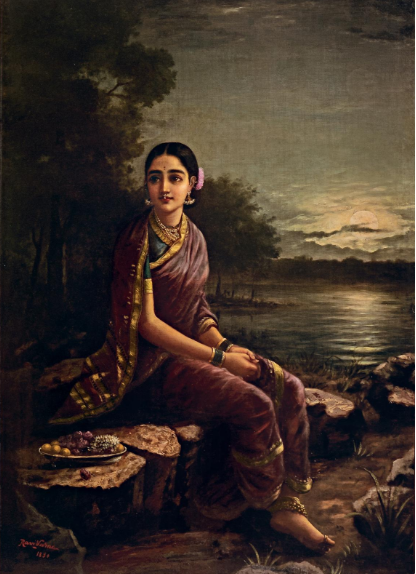 Raja Ravi Varma greatly admired van Ruith's work, and a whole generation of Indians have internalised Ravi Varma's portrayals of soft, vulnerable, Indian women. I don't have anything against either van Ruith or Ravi Varma, or the way in which they portrayed what they did. All humans have a gaze. If you want to tell a story about someone, you need to adopt a gaze; and they adopted what came naturally to them. But my personal view is that in portraiture at least, if a story-teller begins from a point of empathy, it would perhaps help tell the story in a more authentic way. The starting point for any portrait artist is to be aware of their own gaze, and how that impacts the portrayal they are about to undertake. I am myself a story-teller; I write about the people of India. My travels in India take me to so many different cultures and communities. Seeing van Ruith's work has come as a good reminder to check my own gaze from time to time! I now am becoming acutely aware of my own gaze, and how difficult it is to tell a story without altering it to suit my imagined worldview. http://www.sothebys.com/en/auctions/ecatalogue/2017/modern-contemporary-indian-art-n09664/lot.102.html This painting of the Brahmin household sold for Rs 2.5 crores in Sotheby's March 2017 auction. I was happy to be featured in Tourism India's Cover Story on women entrepreneurs in tourism. Interviewer: Mumbai Magic is considered as one of the rarest Responsible Travel experiences in India. How did it all begin? Deepa: I graduated in 1990 with an MBA from the Indian Institute of Management, Calcutta. I spent nearly two decades of my career in the corporate world, mainly in banking technology. I travelled widely due to my work, and met people from many countries. 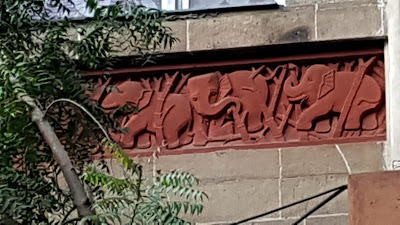 My journey in tourism only started in my late 30’s, when I realized that India has so much more to offer to tourists than just monuments and shopping. So I set up a guided tours company that offers bazaar walks, heritage walks, art walks, food walks, home-cooking, textile trails, craft trails etc. Initially, it was just a hobby, which I did along with my corporate career. But what started as just a hobby in 2006 has now become the largest pan-Indian guided tours company in the inbound segment, offering offbeat experiences in 27 different cities. Mumbai is our flagship city, but we are not just “Mumbai Magic”; we have 27 different Magic cities! I have personally visited these cities, read a lot about them, walked and explored the lanes and bazaars, and created these tours. So we are not just tour resellers, we are an imaginative company that creates tours, and we continue to launch at least 5-6 new tours each year. Across India, we now have a network of more than 100 guides and experts, who help tourists see the “real India”. I believe that tourism is a great area for women to work, since the work is flexi-time and part-time. We employ female guides wherever possible – in fact, we currently have the largest network of women guides in the country, and many companies approach us for providing safe travel for female tourists. 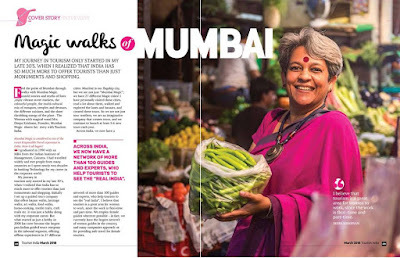 Interviewer: You are one of the pioneers in Responsible Tourism initiative in urban travel segment who have already created different aspects to Travel through our cities, especially in Mumbai. Please tell more about this journey. Deepa: I have always wanted to make a positive impact through the tourism business. So we employ and train students from slums, in order to help them earn incomes and get work experience while they are in college. We have created two flagship tours – MUMBAI LOCAL and DELHI BY METRO – in partnership with local non-profits. These tours are run by college students from low-income neighborhoods, and they use local transport (bus, taxi, train, rickshaw, metro, etc.) to explore the city. Tourists really enjoy these experiences, because they are offbeat and interesting. The income from the tour is shared between the student guides, the non-profit, and our company, thus providing a winning combination. These tours have been running successfully for the past 10 years and have contributed significant income to the students as well as the non-profits. We have had 52 college students work with us (usually for 3 years or more), and they have all made us proud through their achievements. Some of our students have now entered full-fledged careers in tourism, some have acquired jobs in top multinationals, some are studying for MBA, some have gone to the USA for studies, and some have started their own tourism ventures. It makes me really happy to see these students doing so well. In many of the cities where we work, we partner with local non-profits and actively canvas for donations to these non-profits. We try to bring incomes to marginalized sectors. Since many of our customers are foreign educational institutes, we create experiences for them where they can understand social issues in a sensitive way without disrespecting local communities. 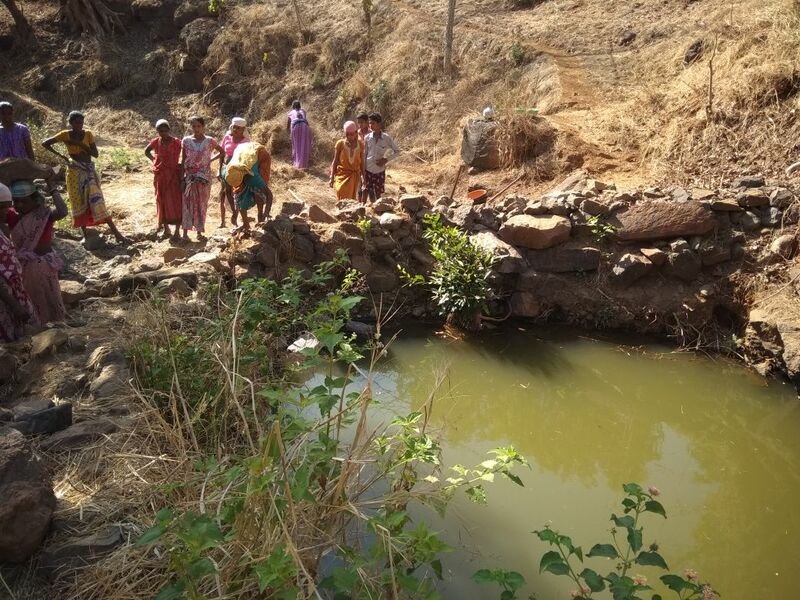 In Mumbai we are ourselves working in 4 adivasi villages (around 4hrs drive from the city), building dams, wells, ponds and other rainwater harvesting structures. In addition, I myself run an education NGO in Mumbai called Abhyudaya, with 500+ children. Last year I also founded Abhyudaya Community Initiative, a women’s self-help group which creates textile craft products. I do a lot of work in promoting Indian handlooms and I am a member of the NABARD Task Force for handlooms. Interviewer: Travel & Tourism sector is considered to be a man’s world. How did you make into this sector and what are the challenges that you faced? Deepa: I don’t believe that any sector is “a man’s world”. When women are flying fighter jets and facing combat situations, why should we have this mindset? In fact, travel and tourism is a great area for women to work in. I can honestly say that I have never faced any challenges specifically due to my gender. Creating and growing a business is always challenging; whether for men or women. If anything, I believe being female is an asset, as you are more easily able to stand out among the crowd. Besides, a lot of foreign tourists often prefer dealing with women. 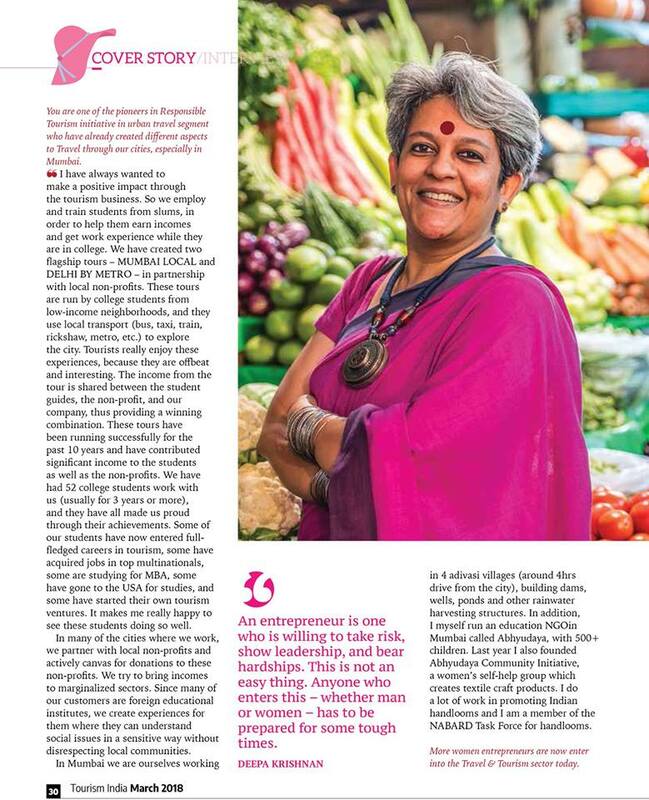 Interviewer: More women entrepreneurs are now enter into the Travel & Tourism sector today. What is the advice you give to such young women? Deepa: An entrepreneur is one who is willing to take risk, show leadership, and bear hardships. This is not an easy thing. Anyone who enters this – whether man or woman – has to be prepared for some tough times. For new women entrepreneurs, my advice would be to develop a strong spine and a somewhat thick skin! Don’t let anyone discourage you, because many people will be very skeptical of your journey. Interviewer: How women can enhance this industry from a woman-point of view? Deepa: I would urge all people in the industry to provide flexi-time, flexi-location jobs. This is a real boon for women. Even for men, it helps to bring more work-life balance. In our office, we provide opportunities for our staff to work part-time and flexi-time. The employees receive a share of the profits, thus everyone is a part of the growth journey. Due to these people-friendly policies, our team has been stable since the beginning. Stability brings deeper expertise, which benefits our tourists. Interviewer: How you feel when you look back on your journey from an ordinary Indian girl to a respected Travel professional now? How you foresee the future of Indian Travel Industry ? 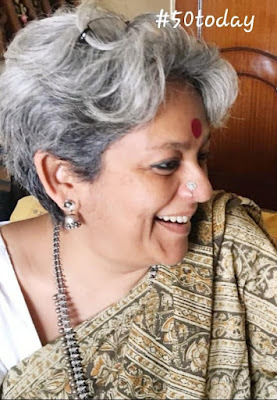 Deepa: I don’t look back very often, but when I do look back, I am happy with the value we have added to all stakeholders – employees, contractors, customers and society. There is still a lot of work ahead, so I am very occupied with the future! Although I have travelled a lot in India, there are still many new places to explore and new experiences to bring to tourists. The Indian tourism industry is still focused on specific geographies, and does not do justice to many exciting and interesting segments. I am hoping to bring more balance to this. How to build an ethical design business? I went to Kala Ghoda yesterday to meet a young man named Yazad. He is from LA, but is here in Mumbai now. The Parsi entrepreneurial streak is calling to Yazad, and he is plotting his own design label. He wants to launch a brand of ethical, sustainable clothing for millennials. Just before meeting Yazad, I went to the new Translate store at Kala Ghoda, and I couldn't help thinking what a great learning ground this store is. Yazad could learn lots of things from this brand. 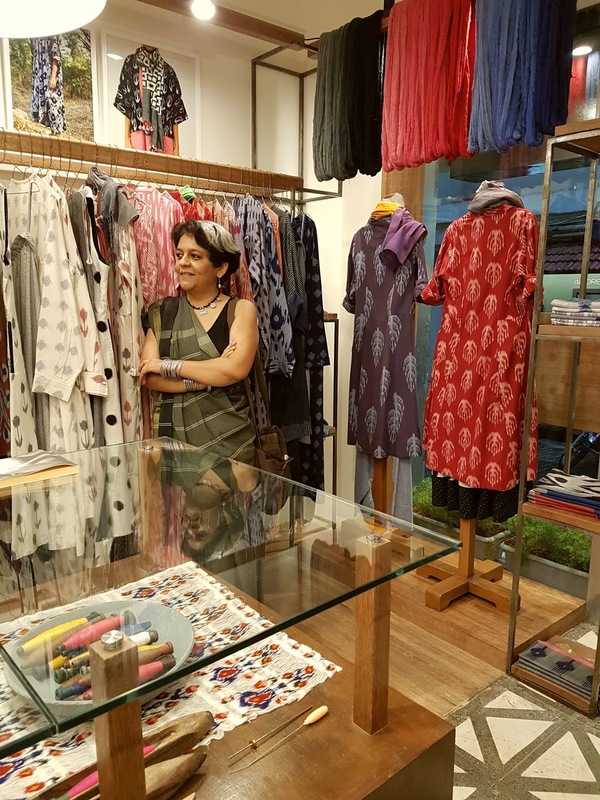 True to its name, Translate has taken the traditional technique of ikat, as woven in the village of Pochampally near Hyderabad, and translated that into something contemporary, innovative and stylish. Urban women can wear these clothes easily, confidently, in lots of different leisure contexts. Some of the shift dresses can be worn to work as well. Translate has taken care with design and finish; the quality is easily visible. The sizing and cuts are designed for real women, not impossibly skinny models. Clearly, Translate knows their audience, and has managed to find a price point at which the business is able to thrive. And they have found a clear design identity niche as well: ikat for sophisticated urban tastes. After their initial days in Hyderabad, they have now expanded into Delhi, Mumbai and Ahmedabad. Any successful design and clothing business, especially one that works with traditional crafts, needs a lot of different ingredients to work well. First, there is product creation itself. This kind of product cannot be done with just top-down design inputs from a designer. It is often is a collaborative process, with the realities of the craft interacting with the sensibilities of the designer. The designer brings their understanding of the customer and market into the game. The craftsperson brings their own understanding of fabric, colour, and technique. In the case of ikat, for example, they bring a very sophisticated understanding of dyeing of warp and weft into patterns. Locating the business close to the craft source is a good way to ensure there is ongoing collaboration between the designer and the craftsperson. But product creation is just the beginning of the story. I was telling Yazad last night that too many designers spend all their energy worrying about the product design. In the process, they forget to focus on the other things that make a sustainable commercial success. It's hard for one person to have all the abilities to make everything work. But if you look at successful designers, you'll see that they all have sharp commercial acumen as well. They've managed to figure out how to finance their business. They've figured out pricing and margins. They've often started out with very low overhead costs, and only later taken on big fixed expenses. They've learnt the fine art of storytelling around their work, creating the necessary buzz (even when their marketing budgets were close to zero). These are fundamental entrepreneurial skills, which someone like Yazad has to cultivate if he is serious about getting into the design business. The other big part of the story is ethics. Yazad wants to run an ethical business. In the design world, this means paying fair wages, giving credit where it is due, and not copying designs. It means following a fair pricing policy. It means upholding the laws of the land. It's really tough for anyone except an insider to figure out whether a business is being run on ethical lines. I'm sure for every ethical design house that exists, there many more pretenders. Running an ethical business can be very difficult, simply because it often means your costs will be higher than those of competitors with fewer scruples. How does one survive in a situation like that? It may mean you need to accept lower margins for yourself. It may mean raising prices - but then customers must be convinced that your products offer them value for the premium that they pay you. What are you giving them, that someone else isn't? Designers must answer that question with brutal clarity if they want to succeed. In the process, you must also define who you want as your customer. And who you don't. Here's the thing: You cannot build an ethical business that will cater to *everyone*. Do not agonize over the ones who go away. Learn some equanimity. My personal belief is that an ethical business can be built only when you don't really place money above all else. You need to be able to accept financial losses when ethics cost you money and customers. Sometimes really big setbacks will come and knock you off your feet. You have to pick yourself up and find the path again. If your value proposition is right, you will find that sweet spot, where customers and money will all come your way. But when push comes to shove, you have to be able to say, "This much is enough for me. More than this is greed. If I do this greedy thing, it will compromise what my brand stands for." I hope Yazad will find his path to ethical success. I hope he will find this sweet spot. Yazad is the nephew of my friend Gulserene. 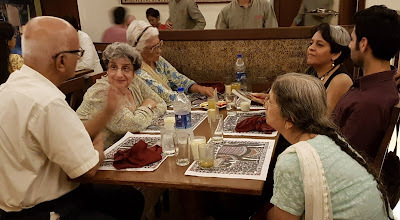 Last night we had dinner at Chetna at Kala Ghoda. Here are a couple of photos. By now I guess at least *some* of you want to see who this Yazad is. That's him in the maroon shirt. OK, OK, burgundy if you prefer :-) My friend Gulserene is the one with the arms folded on the table. We were chatting into the night, long after our plates were cleared. 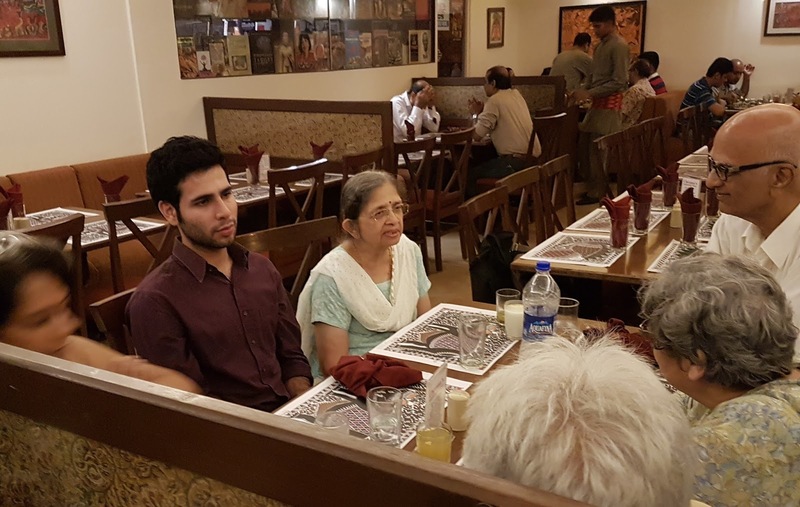 At last night's dinner, I had the privilege of listening to Dr. Sunil Pandya of KEM, who has been at the forefront of medical ethics in India. Dr. Pandya's wife Shubha - sitting just across from me - is also a doctor (her area is leprosy); and she has a PhD in history as well. Next to Yazad is Dr. Lopa Patel, again from KEM, whose research work on cancer has generated much controversy. She has stood firm by her beliefs. What an amazing set of people, each making a difference to the world in their own way. Gulserene made a documentary on KEM, called "Getting Better" - and she is the thread that tied us all together. More about her documentary in some other post, perhaps! 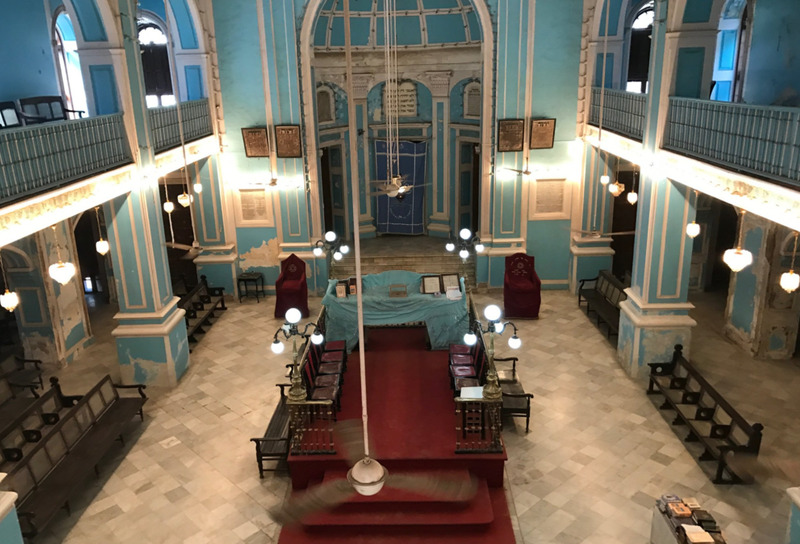 In the late 1700's and early 1800's, Jews from Iraq began arriving in Calcutta and Mumbai. It was not the first time Arabic speaking Jews had made their presence felt in India. The Great Mughal Akbar had a Jew in his court, and so did some subsequent Mughal emperors. Surat was one of the major ports of the Mughal empire, and Jewish merchants were well-established there, trading with the British East India Company. As Mumbai prospered in the 1800's, Jews from Iraq, Syria, Afghanistan and Yemen began arriving in Mumbai in significant numbers. A lot of them came from Iraq, and so they were called Baghdadi Jews. 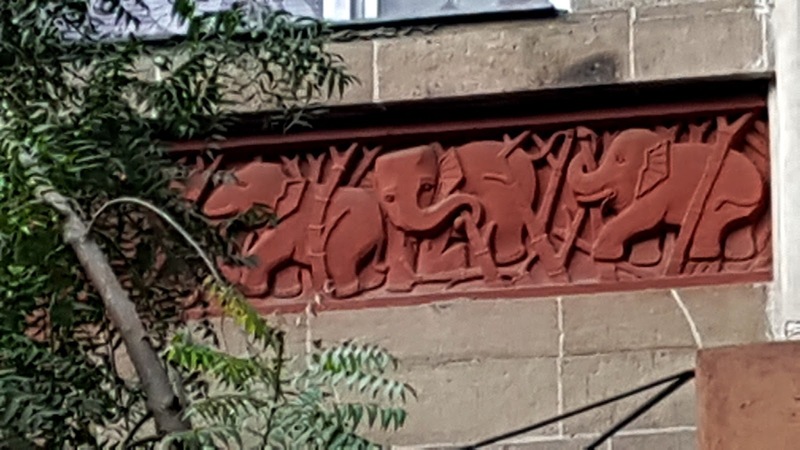 There was already another Jewish community in Mumbai, the Bene-Israel (Children of Israel). Believed to be one of the "ten lost tribes" of Israel, they had been in India for many centuries. The Bene-Israel were quite different from the Baghdadis - they spoke Marathi, and looked more Indian than Middle-Eastern. 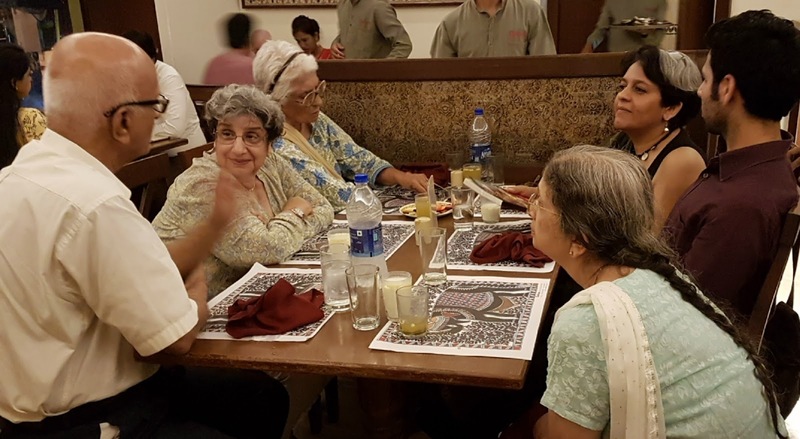 After many centuries in Maharashtra, Bene-Israeli cuisine had become localised, while the Baghdadi Jews followed their own cuisine. The prayer rituals of the Bene-Israel were also different from those of the Baghdadis. The two communities therefore, maintained a cultural distance, and did not intermarry. In the initial years, the Baghdadis were few in number, and they prayed at the synagogues of the Bene Israeli community. 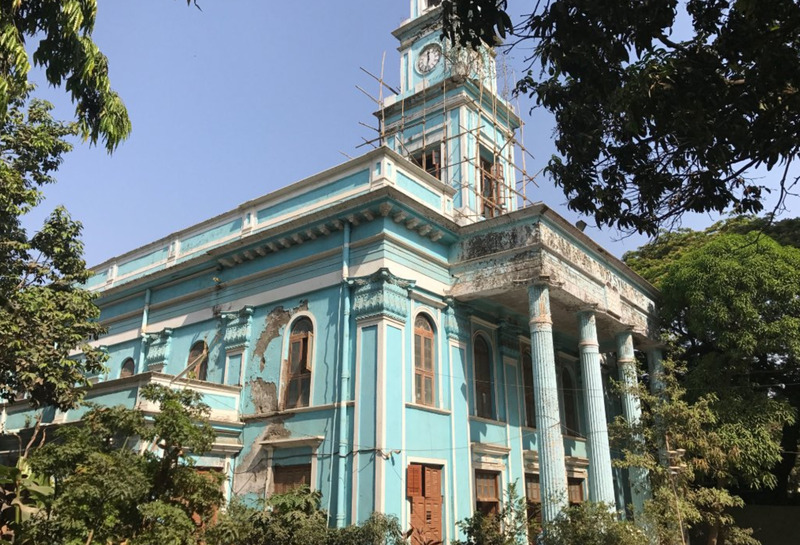 But as their numbers grew, they began to want their own synagogue in Mumbai. Two factors made this dream a possibility. The first was the arrival of the wealthy Sassoon family of Baghdadi Jews in 1832. The second was the opening of the opium trade in the 1840's which allowed the Sassoons to amass huge fortunes. As their wealth multiplied to astronomical levels, the Sassoon family naturally became the de facto leaders of the Baghdadi community. Building a Baghdadi synagogue was an obvious logical demonstration of that leadership. The patriarch David Sassoon was a practising Jew, who observed the shabbath throughout his life. In 1857, while the country erupted in flames of revolt against the East India Company, David Sassoon moved ahead with plans for the first Baghdadi synagogue in India. The Sassoon family owned land in Byculla. A plot was identified and architectural design commenced. 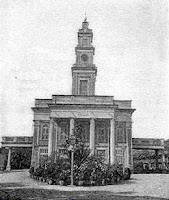 The design selected for the synagogue was Western-inspired architecture, rather than Middle-Eastern or Indian. Perhaps it was because the Sassoons were quite well-aligned with the British. While David Sassoon did not speak a word of English, his three sons did, and they wore both traditional and Western clothes. Construction progressed quickly. In 1861, the synagogue was consecrated, and named Magen David, Shield of David. It was the largest synagogue in Asia at the time. 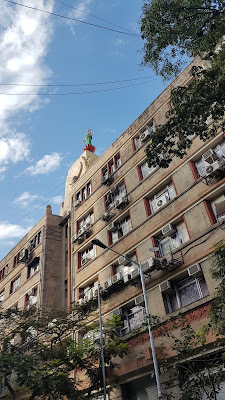 A few years later, the Sassoons built the Ohel David in Pune, which I think is even larger, although I cannot tell for sure. Here's an old photo of Magen David synagogue. In the 1900's as the Baghdadi congregation grew, extensions were added on both sides, which are missing in the old photo. But you can see the extensions in this illustration below, which I got from the Sassoon Trust website. I have visited Magen David on and off in the past 10 years. It used to be cream/white in colour, as the illustration shows. Somewhere in 2008, it was painted an attractive blue and white colour. Blue is the identifying colour of Judaism, just as the saffron colour identifies Hinduism. In the Torah, the Israelites were told to dye a thread on their tassels with tekhelet, a blue ink from a sea creature, perhaps a type of cuttlefish. The Israeli flag is also blue-and-white (actually tekhelet is supposed to be a dark almost violet-blue). When you stand in front of the synagogue, the most obvious architectural aspect that strikes you is the flat-roofed porch supported by four columns. The entablature contains the name of the synagogue in English, and there is a tablet showing the ten commandments in Hebrew. 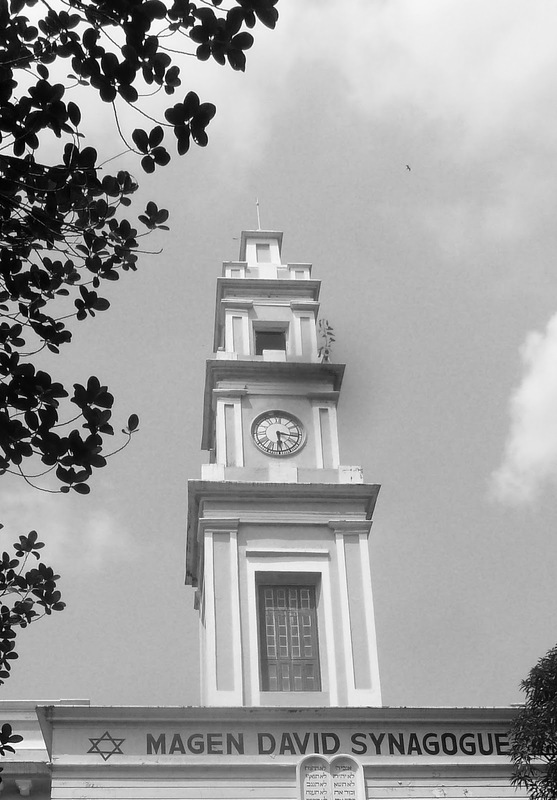 If you step back a little from the synagogue, you can appreciate the central stepped tower. The tower is inspired by a similar one in Trafalgar Square, London. The one in London is called St. Martin in the Fields, you can see it here. There's a clock on the tower that was brought from London. 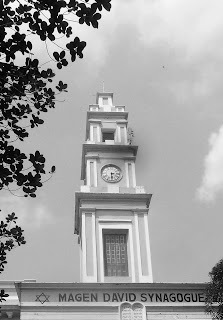 It was an era when everyone did not have the money to own a pocket-watch; so public buildings had clocks to help the populace figure out the time. This is the view from the first floor, which is the women's area. The synagogue has separate seating for men and women, as required by halakha (Jewish religious laws). While gender separation has been a part of orthodox Judaism, there have been many reform movements trying to change the requirements. Particularly in Jerusalem, it's interesting to see how the orthodox control over the sacred Wailing Wall of Jerusalem is being contested by the "Women of the Wall" They have been fighting for equal right to access and pray at this holy site. Today I am waiting for a guy named Rajnikanth to come home. No woman ever waited for a man so much :) He was supposed to come yesterday but did not. I have been trying to entice him to my house for 2 years now. Who is Rajnikanth? He is a 5ft tall adivasi man who is going to paint a traditional Warli mural on my wall. 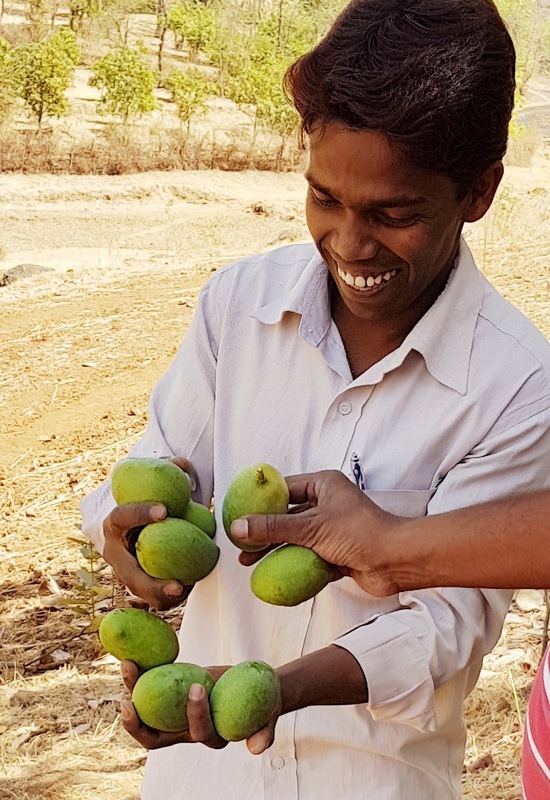 He lives 4hrs away from Mumbai, in a small hamlet. Each time I visit the village, I ask him "ghari yeta ka?". Will you come home? Each time he looks down and smiles and says nothing. He has a smile that lights up his face. What he will earn from one city visit is more than his annual income. I have explained that. But the adivasi mind is a strange thing. It works in its own way. Everything cannot be bought by money. He is willing to do carpentry work in nearby town but not come to Mumbai. But finally he seems to be relenting...after multiple visits and relationship building and egging on by the headmaster of the school. Today again I am hoping that at 8:30 am he will board the bus. 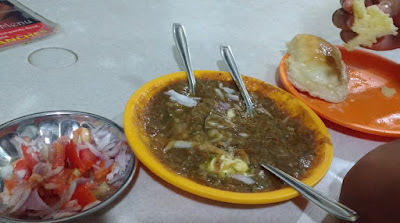 Yesterday, I tried black pav bhaji at Maruti Pav Bhaji in Vile Parle. 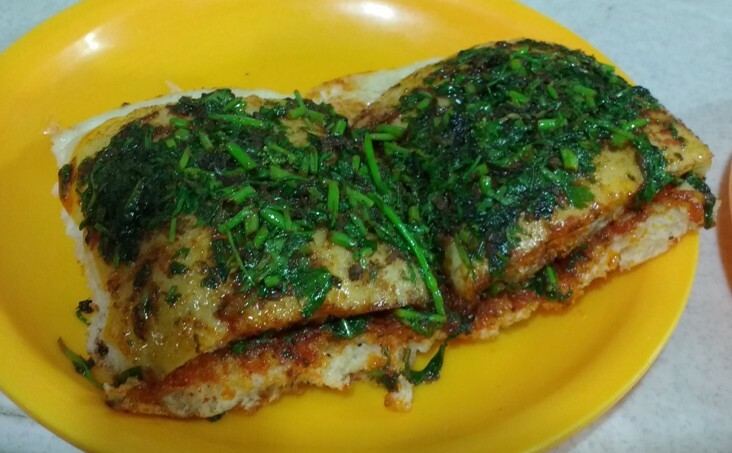 It was recommended by my friend Pooja, a long time Parle resident. I trust her judgment on food. (We have bonded over college canteen sev puris and Gurukripa samosas. My mother has been awestruck by Pooja's capacity to eat). 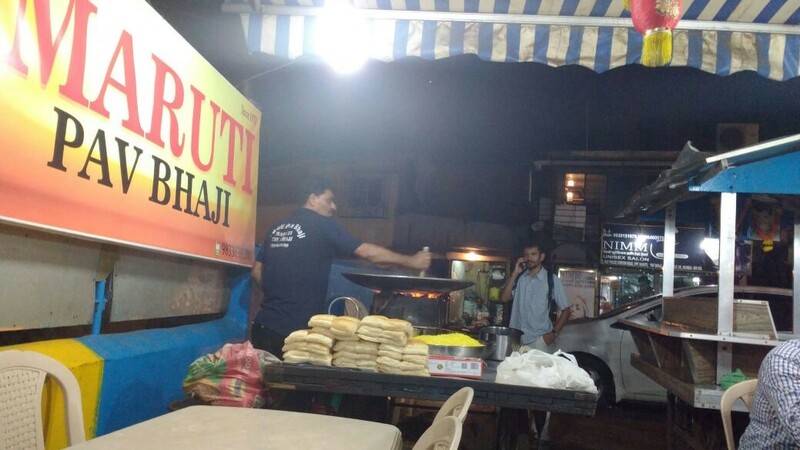 On top of that, a Google search told me that Maruti is now featured on a few lists of Mumbai's best places to eat pav bhaji. So when the mood for pav bhaji struck, I decided to try out this joint with another friend. It's a roadside stall called Maruti. I don't know why his pav bhaji is black. Some people on the interet attribute it to black pepper while others talk of "secret black spices". The pav bhaji itself was delicious. It was indeed a little different from what is usually served as pav bhaji. But a special mention goes out to the masala pav (below). It was a real bomb. It was overflowing with spice and flavour. My stomach is not yet sure how it's going to respond to this level of chilli but I already know I'm not going to have any regrets.